A short review of PeerLock and how it has worked (and hasn’t) for us. We use DFS through Windows Server to replicate our files to each branch office. This is preferable to having really slow access from the branch offices, or not having a consolidated file structure from which to work from. One of the disadvantages of DFS is the lack of File Locking. If you have a file open on any member server, and someone opens the same file on a different member server, you will receive no notification that the file is in use. This review is mostly a grouping of my comments on that blog post. 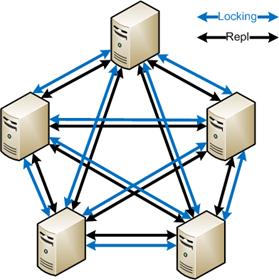 PeerLock (http://www.peersoftware.com/products/peerlock/peerlock.aspx) is software used to facilitate locking of files between servers. It is installed (and licensed for) each member server that contains a copy of the files you want to lock. In our case, we have one hub DFSR member, and 3 spoke DFSR members. We set up the PeerLock program to watch each of our DFSR shares, with the target being the same DFSR share on the spoke servers. Well, for us, it didn’t work out. We are still using PeerLock, but in a much reduced role. Note: this is based on version 2.02. We haven’t budgeted for an upgrade to the latest version, so performance may be improved. Since we are replicating about 900 GB of data, with 100`s of files open at once, across business ADSL connections, PeerLock ended up causing many replication issues, conflicts and sharing violations. At times, by 8:30AM we would have over 1000 files in the backlog, and they wouldn`t clear because DFSR had too many sharing violations. Through experimentation we found this was directly caused by PeerLock. Because of this we have begun using it only for high-collaboration folders, instead of our entire DFSR shares. On a smaller scale, it has been working great, and other than the steep price I would recommend it. Our files and folders that are commonly shared between offices are protected, while the majority of our files which are used by only one office are just monitored for conflicts. Peerlock can run as a GUI, or a service, but not both. This means to run on a server that is logged off, you need to use the service, but to make configuration changes, you have to stop the service, start the GUI, make changes, close the GUI, start the service. CPU usage is very high with a large amount of files protected. The program was using about 35% CPU constantly, on a 2009 PowerEdge 2900 server with a single Quad Core CPU. Price – it was somewhere around $990 CAD per license, and you need one for each server. We’re running Peerlock successfully in a three-server setup with DFSR. Our experience is that the apparent problems with Peerlock are purely cosmetic. Peerlock will cause an entry in the DFS replication backlog for every Office file a user has open, for as long as they have it open. This appears to be because Office will actually close and re-open the file several times in normal use, at which point DFSR will attempt to replicate it, but it will be blocked by the still-extant peerlock lockfile (which has the same name) on the remote server. This is also the cause of the warnings about failed attempts to replicate a file. We have never seen an error event about DFSR giving up on replicating the file – we just get warnings until the user finally closes the file, at which point it replicates successfully. Peerlock *is* a bit hairy and they could definitely do some thing to improve our confidence level in the product, but it *does* work at least for us. A customer of us is using peerlock and he isn’t quite satisfied… Primary because of the reasons above.. Did you find a suitable alternative to peerlock? Unfortunately I haven’t found an alternative to Peerlock. I briefly considered using Globalscape WAFS, but found it was unsuitable (the reasons for which are in my comments on the AskDS blog post linked at the top of this post). And I can’t justify the cost of the full PeerSync suite. For now we’ve been scraping by, by manually watching the conflict logs, and using Peerlock on an individual folder basis where we know there is high collaboration. Within the month I’m hoping to have the updated version of Peerlock purchased and installed, but I doubt I’ll enable it across the whole DFS share. I’m secretly hoping that file locking is somehow worked into DFS in Windows Server 8, but that’s a longshot. Thanks for the comment Heitinga. Would you be willing to share any more information about your use of PeerSync? I’m very interested in the size of your environment, as well as how its worked for you and if there is anything to watch out for. Are you still using PeerLock? Did it ever improve beyond what you mentioned here? Hi Suraj, we never went to full production with PeerLock, as it wasn’t integrated close enough with DFSR to resolve the backlog/conflict issues, so unfortunately I don’t have any more information. Oh ok…so how did you address DFS issues without PeerLock ? Any other tool which worked or just gave up multi master read write DFS setup all together? The last update I had posted about what we’re doing was here: (https://faultbucket.ca/2015/09/file-server-and-remote-office-collaboration/) and realistically there hasn’t been much change since then. I’m quite interested in the Talon FAST software but haven’t gotten it to a proof-of-concept yet. Here’s a video outlining the benefits: https://channel9.msdn.com/Events/Ignite/2016/BRK3209 (good stuff starts at 54:00).